Catering to the needs of administrators, OMR Home has provided Verificare OMR software that is a pioneer in designing varied OMR sheets backed with all the necessary features. This sample has got 180 questions, divided by 6 rows. 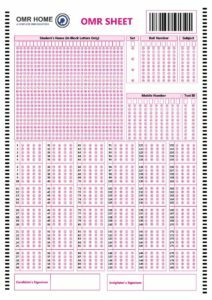 Each row consists of 30 questions and a set of 5 questions. Candidates should be careful while filling the OMR sheet as no wrong bubble should be marked.